Easy to assemble - Heat the PE hose first (with e.g. hairdryer or hot water) and then install the nozzles for easy assemble. 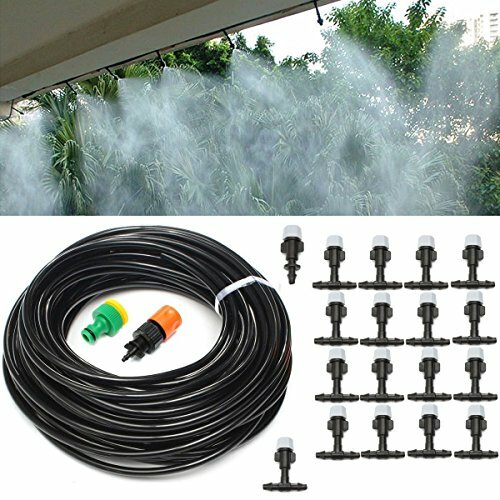 Great Misting Kit - You will beat the summer and cool off with this awesome misting system outside your home, around the swimming pool and the fountain. And it's also a great Garden Irrigation Kit. CONNECTION : Connect with 1/2" 3/4" male thread water faucet.Ideal for agriculture, lawn, garden, patio, greenhouse, swimming pool misting fog cooling irrigation. If you want to extend the kit, you could add a water pump or contact us for help. If you have any questions about this product by ZivaTech, contact us by completing and submitting the form below. If you are looking for a specif part number, please include it with your message.